I know I’ve been a bit absent from here and Twitch streams for the last couple of weeks. This is partly because I’ve been sore (nothing new or unusual about that) and I’ve also been working on my website and coding some more random prompt generators over at RaspberrySheep.com. It’s still under construction, but it has some working parts and links, so feel free to have a look. If it’s broken, I’ve likely been trying something new. As for the mail I received, I bought some things from eBay last fortnight, so they’re arriving slowly. First thing that arrived was my Touchfive markers. The Touchfive markers are an alcohol based marker, like the Copic markers, but a fraction of the cost. I only bought the set of 40 markers to see how I liked them, but there’s 168 markers in the full set, which I will be buying soon. 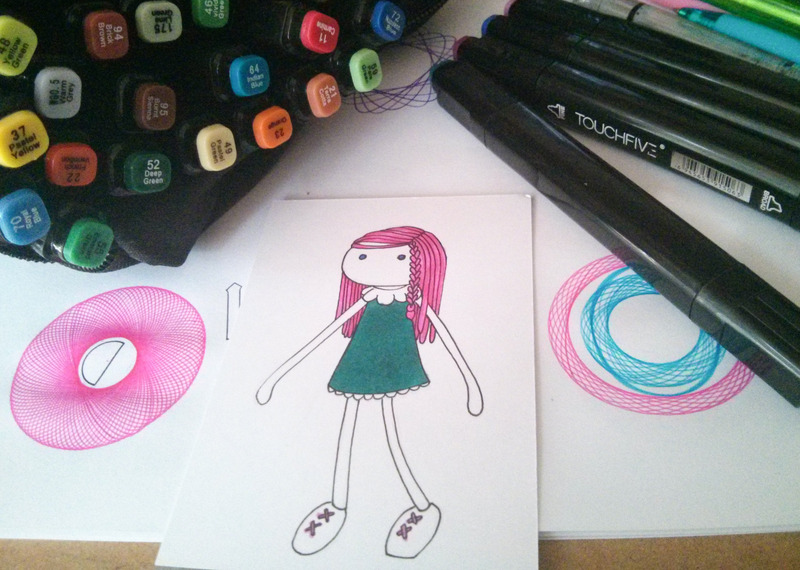 I was very pleased with the quality of these markers, considering the cheapness of them. At approximately 50 cents per marker (compared to 7 dollars for Copics,) they not only have great colours, but I’m not as worried about using up the ink. The pens are dual ended, with a chisel tip and a bullet nib, and have been said to run out of ink quicker, as the flow of ink is faster than other alcohol based markers. This is not a flaw in my opinion, as there is better coverage in the first application of colour, and with the price, you could replace the marker fourteen times to match one Copic marker. 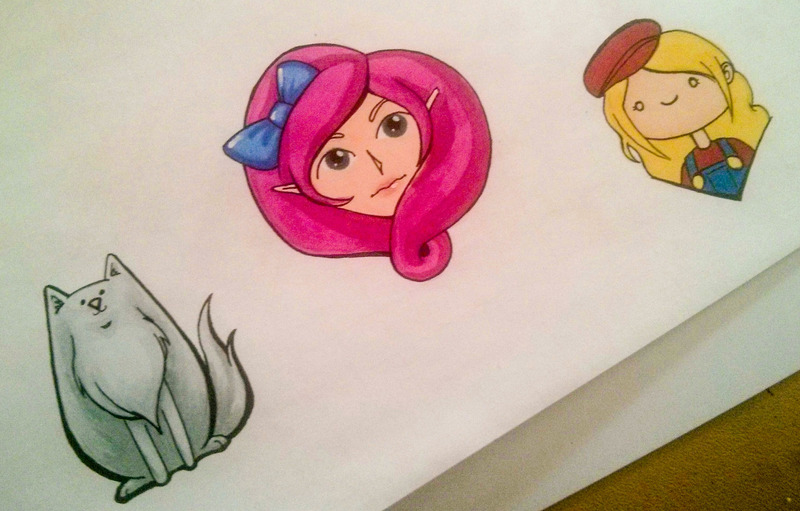 To try out these markers, I have been drawing on label paper to make my own stickers. The bullet nib makes small pictures fairly tricky, but I have been trying out colouring before inking the image. This was mainly to avoid issues with the ink smudging, but this allows some room for correction, as you can modify the line based on how the colouring goes. 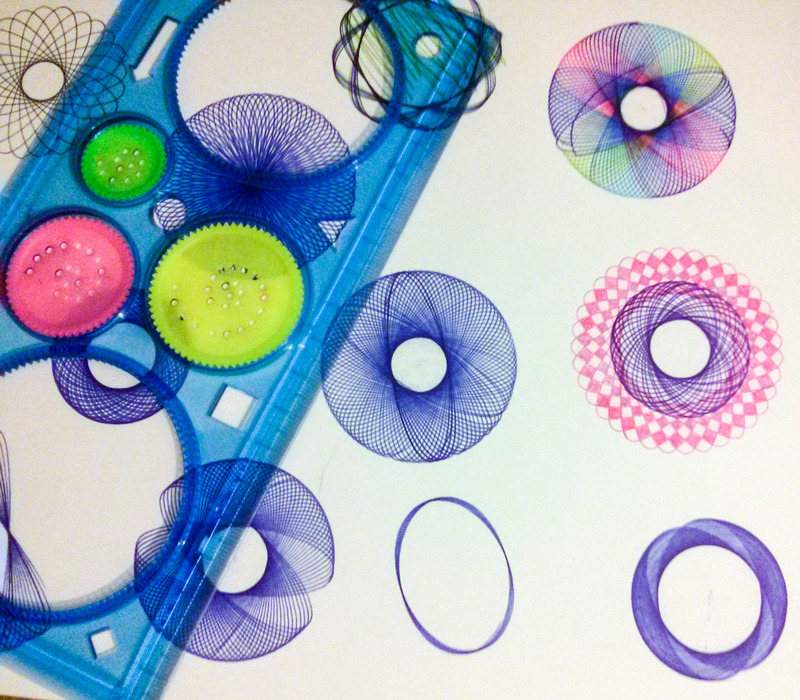 The other item I received this week was a spirograph. Most of you will recognise these, and they are returning in popularity lately in force. Unfortunately the official brand name kit is about twenty dollars, and I wasn’t sure I wanted to spend that much on it, so I bought a cheap one for three dollars online. As fun as it is, I am way out of practice and my spirals are inconsistent. It’s very hard to hold the large piece in place, as my hands cramp before i finish the pattern. I tried some bluetack, but it lifted and the circle snuck underneath the stencil. I found ballpoint pens to work the best, and luckily, I had a few colours to try out. 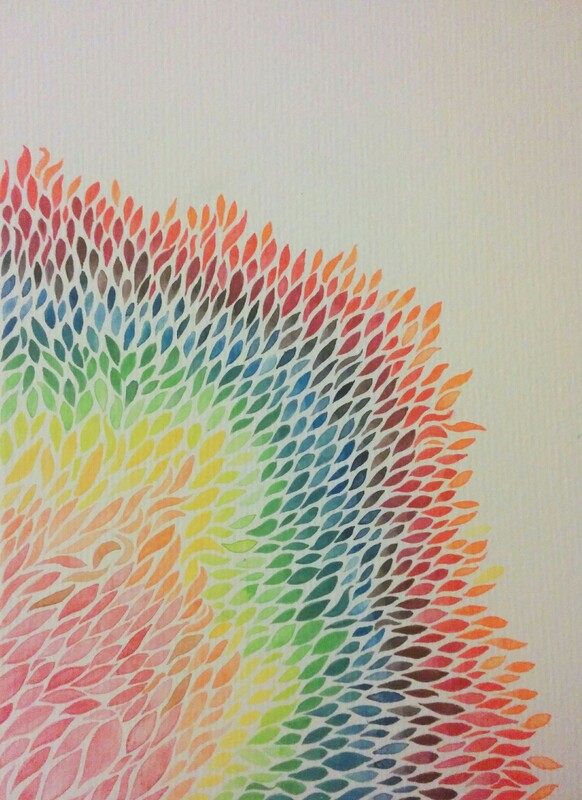 These would make cool designs to put on cards and making patterned paper. I keep forgetting which holes on which circles make which designs, so hopefully I can come up with a diagram to remind me, as the kit didn’t have any helpful information. All trial and error I guess. Now, go forth and try new things. We had a great stream on Tuesday, where I scanned in a comic that I drew and coloured it in over the two hours. I didn’t quite finish at the time, so here it is completed. I used both Paint Tool SAI for the linework, and used Photoshop for colouring and text. My friend attempted to teach me how to used clipping masks, after she was appalled at how basic my skills were. I’m mostly self taught, so I tend to do things the hard and tedious way. I really should but some effort into learning the programs, so I can use that extra energy and time on improving my art skills. I am very enthusiastic at the moment towards improving my digital art, as I would like to sell prints one day. There is a plethora of obstacles between now and then, and the easiest to control is practicing and improving my art. I have been looking at websites like CGSociety for inspiration, where artists submit their high quality digital art. It’s easy to be jealous and feel inadequate when looking at these galleries, but I just remember that I’m striving to be better and am constantly learning. Just because I can’t stand up to the standards of them yet, doesn’t mean I never will, and gives me a goal to aim for. 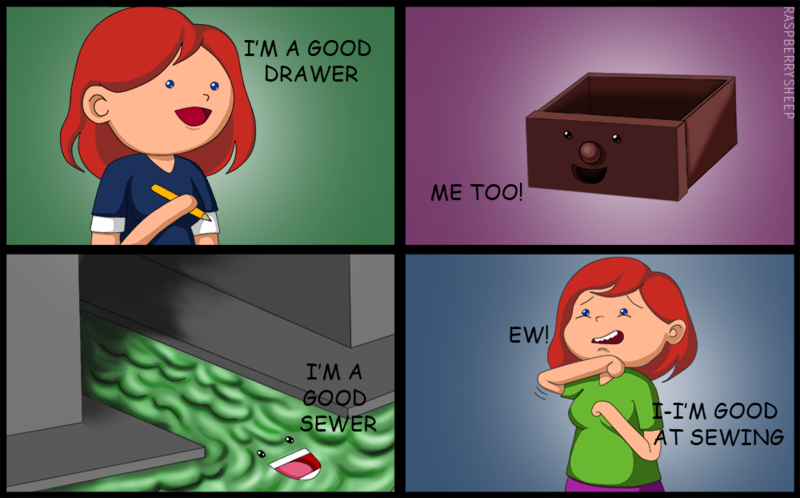 At least I’m a good drawer. My computer is back up and running, with half of the files salvaged! Yaaay! Unfortunately, the half that was lost included all my Photoshop and Paint Tool SAI digital art as well as my streaming layouts, so quite a heavy blow to the system. But hopefully I’ll be all ready to stream on Tuesday with renewed vigor, and inspiration due to a meet up we had with other local streamers on the weekend. Now that I have a void in my portfolio, I have twice the motivation to get cracking on some new pictures and perhaps old ideas revisited with my current skills. As well as this, I have been able to experience letting go of some art, which I have been unable to do up until now, which has impeded me in the selling of art, as I’m always too attached. I’ve learned that life goes on. Life after Art, I suppose. Anyway, I’ve been drawing some pictures to scan in and work on. The one above was based on a pose in a set by Sellenin on Deviant Art. I was discussing that I feel unusual copying poses, but then, I was using​ as a base to layer on a design of my own. I guess I should use my drawing mannequins, or real life more often, to help with this issue. This piece was highly enjoyable to draw, as it was nice to thing of my favourite things and was a nice break from all the annoying things that happened this week. Both my phone and my computer decided to have issues on the same night. This means any art that I have made on either one has the chance of being lost forever (unless I’ve posted it on here). Over the last four years, that’s a lot of pieces. What’s even worse is that I had been planning to transfer all my important pieces to cloud storage recently, and it was all a matter of putting it into a certain folder on my computer. So very frustrating. Luckily I had a spare phone so I can still post here, and I’m still creating to keep busy. Playing around with watercolours while without my computer. Kind of a cubist jumble of colour. 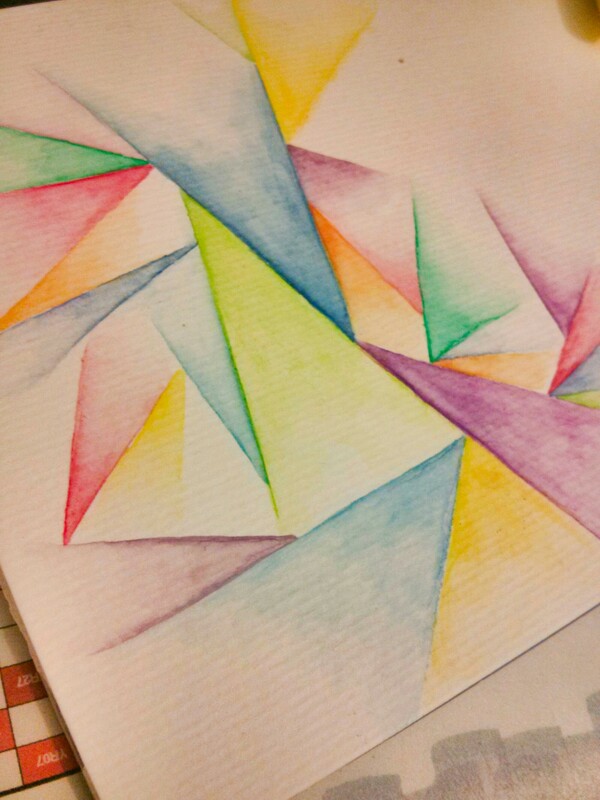 An exercise in straight lines and watering down the colour so it faded into the paper. I had a very in depth discussion today about my art and whether it’s good enough to sell. I’m feeling pretty good about it now, but lacking access to my digital art tools, I decided to try some ideas on small pieces of card. This picture was produced as a result. When I finished, I noticed she looks a lot like my Raspberry Sheep avatar version of me, and would look great on a business card. Unfortunately, I am going to an event tomorrow which they would be useful at, but it’s far too late to make them up now. If only I had thought of it earlier. I guess this is a lesson about planning ahead and backing up files. Things did not go to plan. 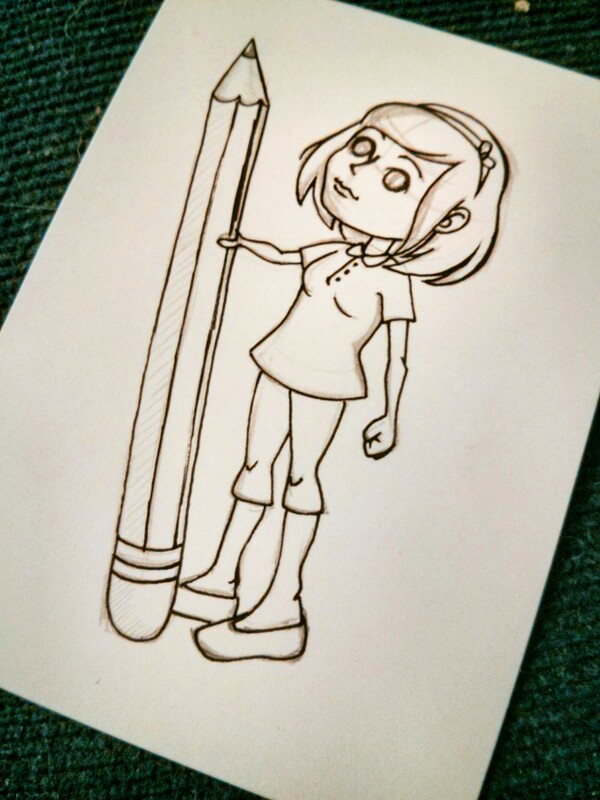 But that didn’t stop me from drawing! I’m really loving the way this picture is looking, mainly because it’s a collage of my favourite things. I’m trying not to look at pictures to influence the way things look and avoiding all copyrighted objects. 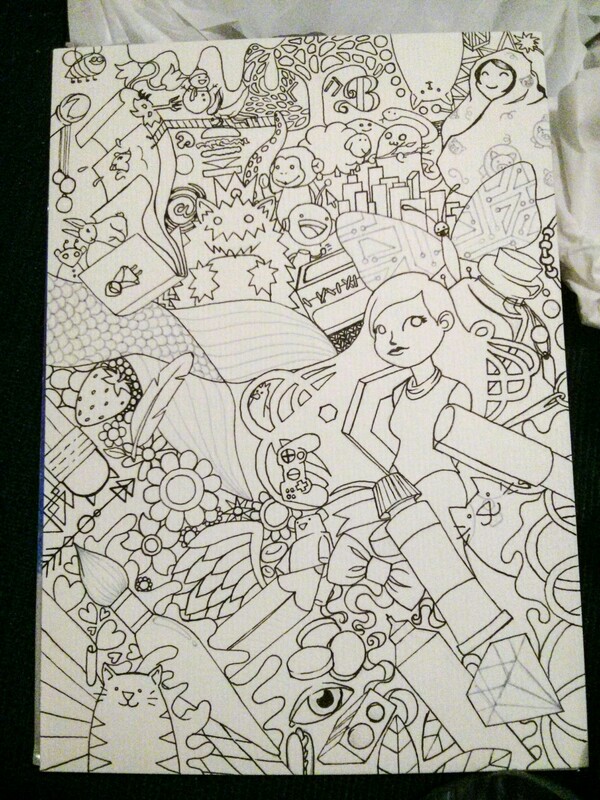 The only thing I didn’t draw was the little game controller that my boyfriend drew for me. The paper I’m using is the same Reeves A5 watercolour paper I’ve used over the last couple of days, and I outlined in a Copic multiliner, which is waterproof, allowing me to use watercolours, once I’ve finished drawing. 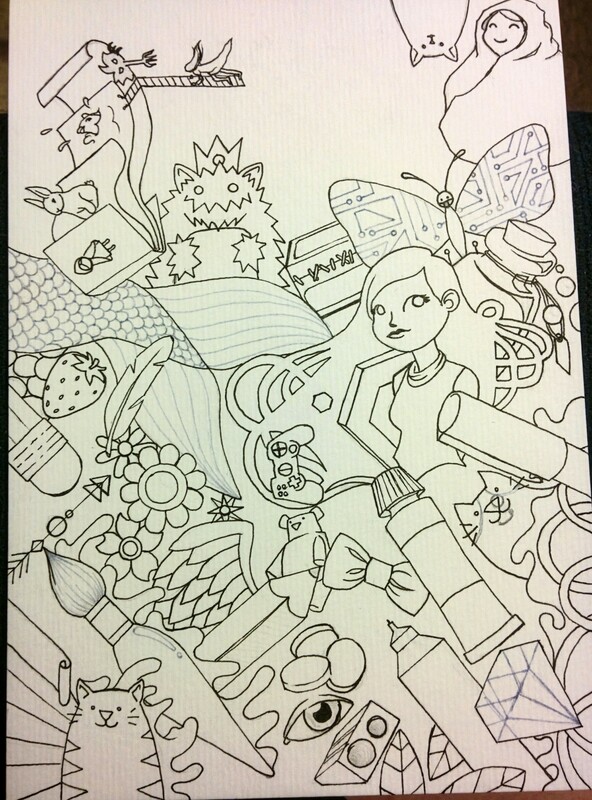 I think I’ve got the doodling bug. Today we have another original piece by me. 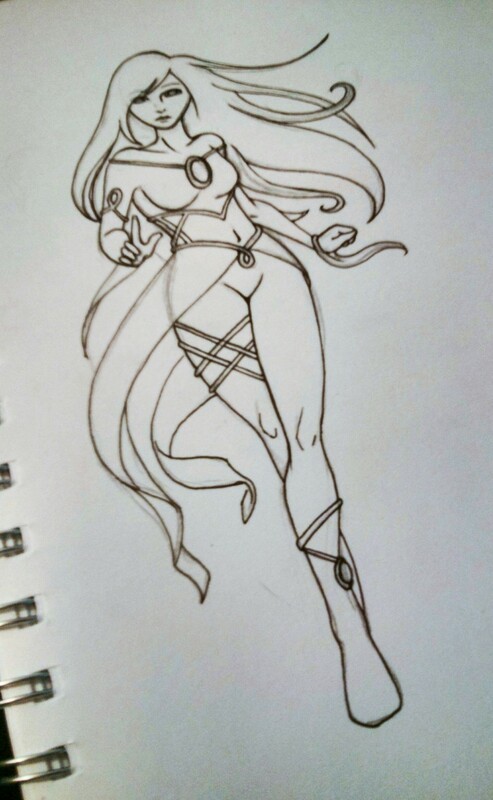 I had drawn this in pencil in my sketchbook a while ago, and forgot all about it until I was looking through it for ideas and something to draw. 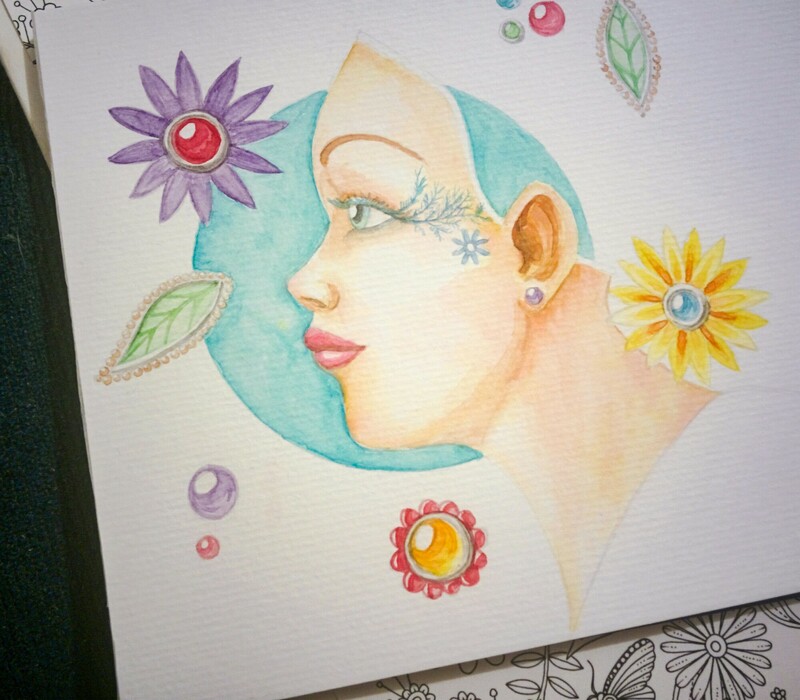 I recreated the picture on my new watercolour paper and worked on her today. There are still some things that need finishing, like the rim where her hair line would be. Trying to get some shadows and contrast is difficult when only using watercolours, as they are transparent and building up dark colours are tricky. No matter how tempting it has been to use coloured pencils or pens to define edges, I have resisted, knowing that this is a challenge I should overcome. I believe this is a great way to grow as an artist and a person. Hopefully if everything goes to plan, I will be able to travel into the city and visit my favourite art shop tomorrow. I’ll let you know if I do. More watercolouring today. 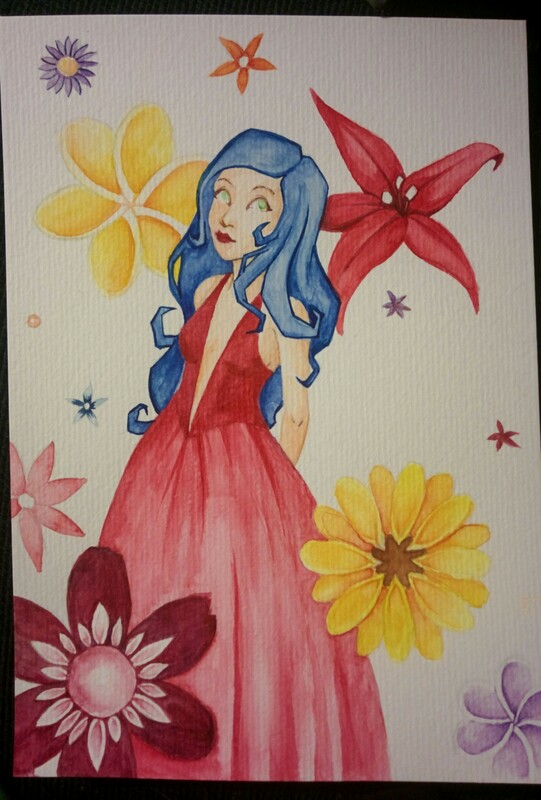 I had an image in my mind of a pretty girl surrounded with flowers. Absolutely nothing like this one, but I like this, despite that. Perhaps I’ll try again at drawing the picture in my head. The problem is, I’m not sure how it’s supposed to look, I just know it’s really pretty and slightly Nouveu. As for this picture, I was thinking of adding some colour to the background, but after a recent picture I did, backfired when I added colour behind it, I was tentative this time. I was thinking some green behind the frangipani flowers, so the the white was outlined a bit. Even though there was a lack of stream last week, the week before proved interesting in the creativity department. Many potatoes were to be had. Let me know if you recognise any of these ‘taters, and see if you can name them all. In more current news, I went shopping yesterday for the first time in a long time, especially without going to the doctors to drain all my energy first. Yay! I bought a small packet of plastic tools for clay, a set of three waterbrushes in various sizes, and an A5 watercolour paper pad. I was eager to try out my new supplies, so I began painting without a plan, which began as leaf shapes, expanding across the page. When I began, I was still getting used to the flow of water in the brush, and it’s very thin, irregular shapes and densities. As I progressed, and became more familiar with the brush, I was able to regulate the flow better, making the leaves more regular, even and smaller as I gained control. I’ll have to make a similar practice for the other brushes in the packet, as they all have different flows. Go with the flow, yo. It has been a hell of a day, and I wasn’t able to stream tonight. Sincerest apologies to anyone who wanted to join, but I wasn’t feeling the best, so the stream wouldn’t have been too entertaining. I spent all day waiting for the plumber to come, but he never did, so I spent some time watching YouTube, playing games and smocking. 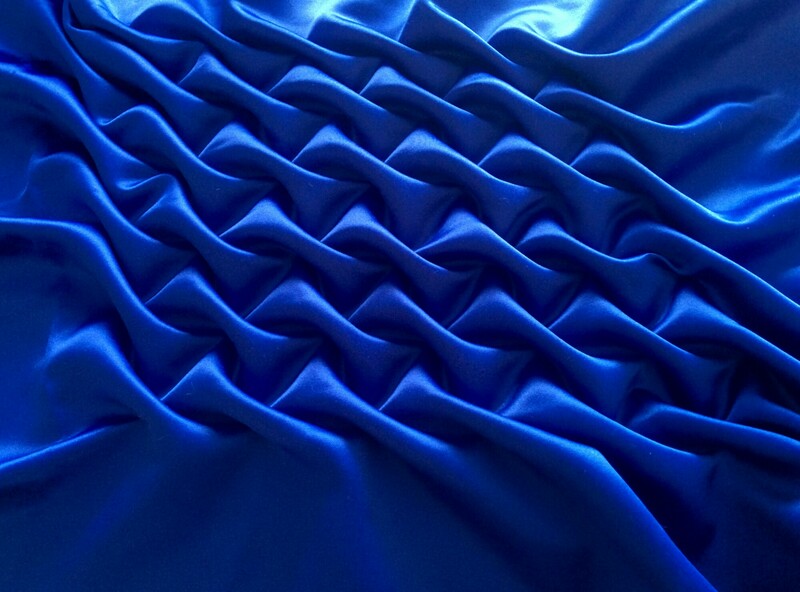 I saw a video by Handiworks showing a smocked cushion cover. The version I saw was sped up, so I just copied based on a quick explanation. 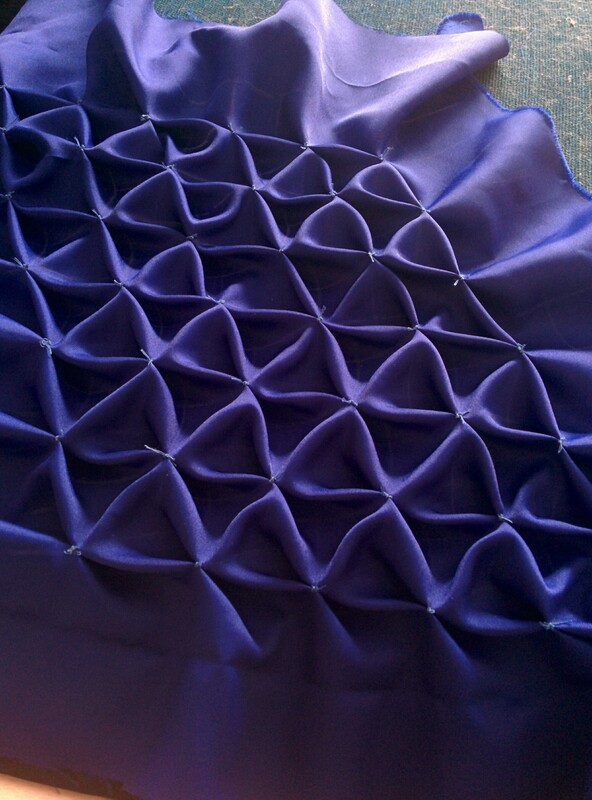 I have to watch the long version to see how to sew into a cushion, as mine is very diamond shaped still, and the smocking is larger. I just really liked the how the satin highlighted the pattern more dramatically than more matte fabrics, and I’ve been meaning to make cushions for our lounge since we bought it four years ago. Here’s a view from the back. I’ve had a pile of sewing projects building lately, so it’s very nearly time for the sewing machine to be brought into daylight. I’ve had to do some research regarding jersey fabric so i can resize some t-shirts, and I watched a couple of seasons of Project: Runway, which made me feel like trying some new things out. Even if I’d never be hold enough to wear them outside, but I have a huge pile of fabric not doing anything else.